Antenna Magus simplifies the process of antenna design by making several design decisions implicitly. While this means that an antenna can be designed without getting into the detail of the synthesis procedure used, it can also make the algorithms lack flexibility. 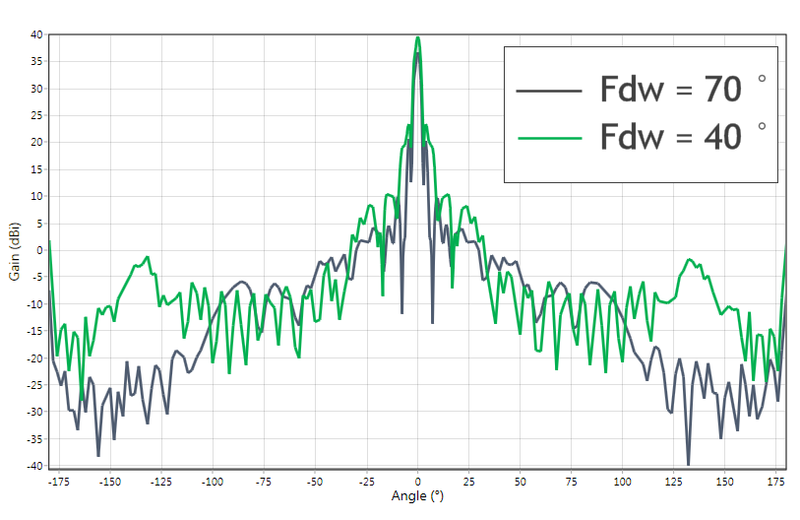 During the development of a customer case study centered on the design of a Ka-band reflector antenna, the usefulness of exposing more of these design decisions to the user for parabolic reflectors became apparent. Version 3.4 is dedicated to releasing design algorithm extensions that do exactly that. There are 2 new parabolic reflector antennas, 2 new tools to aid in parabolic antenna design and 58 new objective groups added to existing parabolic reflector antennas. This added complexity makes the reflector class of antennas much more flexible, and will allow users to realise even better designs! 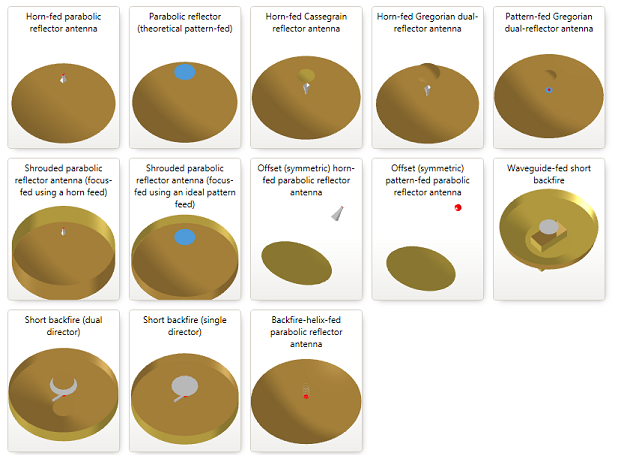 Parabolic reflector antennas are composite structures that provide a larger number of design variables than many simpler antennas. At each stage of the synthesis process, many of these variables need to be chosen, with no single choice being universally correct or incorrect. For instance, the level of the edge illumination of the feed pattern is commonly chosen at -10dB, but for some applications -4 dB is sufficient while -25dB may be required for others. Previous releases of Antenna Magus provided parabolic reflector design options for frequency, gain and beamwidth and (in certain cases) the gain of the feed structure could be controlled directly. Though this capability is very powerful, it is limited because other design decisions are not exposed. 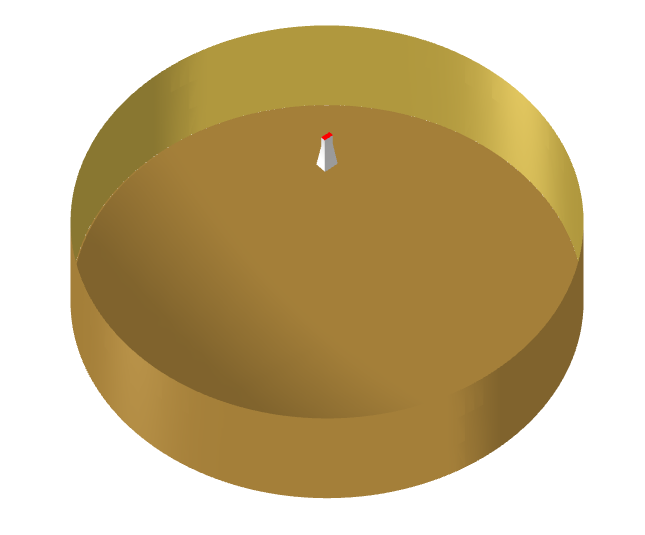 The ideal aperture antenna would have a uniform field distribution in the aperture - this would create an aperture efficiency of 100%. Since real feed antennas do not have uniform field distributions, the actual feed distribution is a critical consideration in reflector design. Antenna Magus Version 3.4 allows these efficiencies to be specified as design inputs. During the design process, efficiency values (as a fraction of a flat distribution or 'ideally' excited aperture) are used to generate an approximation of a realistic aperture distribution. 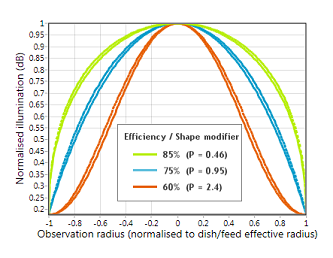 The shape of a realistic feed aperture distribution differs from that of the reflector aperture - this difference is affected by the F/D ratio of the dish (and sub reflector in the case of dual reflector antennas) and feed placement. Therefore an iterative approach is needed to design the reflector for the given performance objectives when the efficiency of the feed distribution is known. For example, assume that the antenna design engineer has a choice of two horns to feed a new focus fed parabolic reflector namely an Axial choke horn and a standard pyramidal horn. When comparing the main beam gain patterns it is evident that the Axial choke has a more uniform amplitude distribution; leading to an increased aperture efficiency. (See the graph below.) 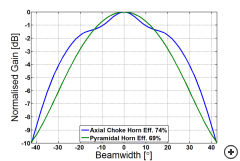 The aperture efficiency is 69% for the standard pyramidal horn and 74% for the Axial choke horn. 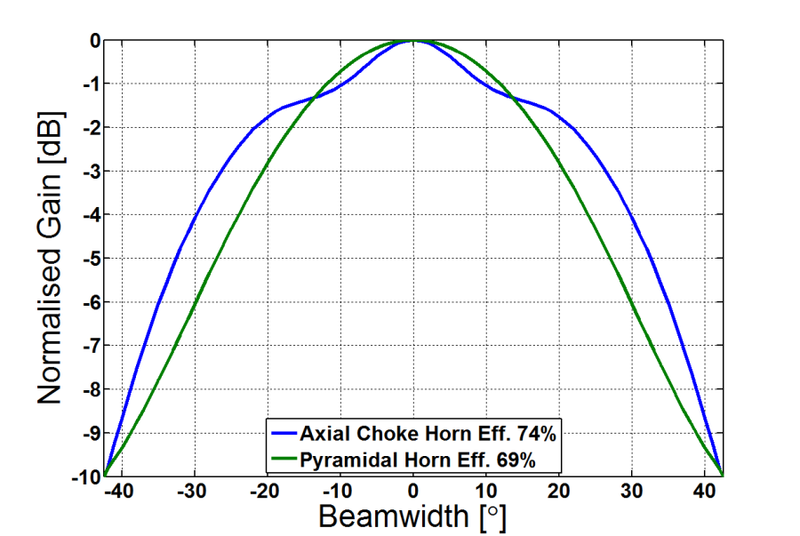 Main beam gain plot and aperture efficiencies for standard pyramidal horn and axial choke horn. 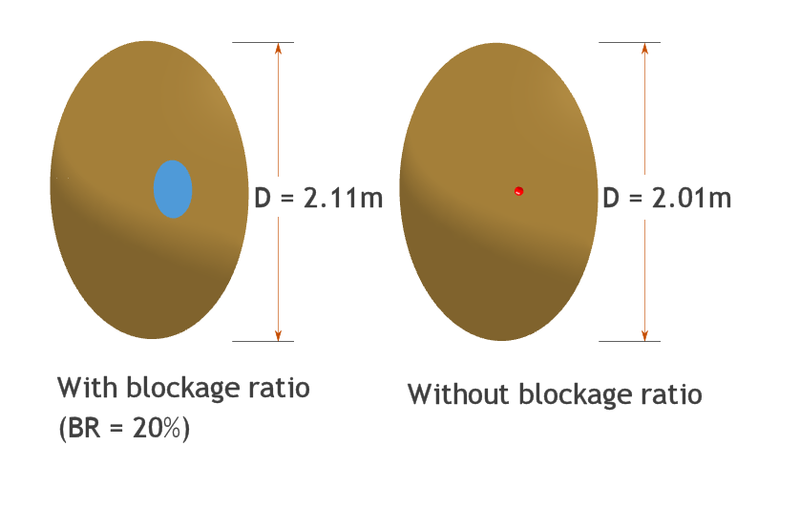 Another critical design consideration for any reflector antenna is blockage ratio (BR). The size of the feed structure (feed antenna, feed electronics or sub reflector - in the case of dual-reflector antennas) affect both the gain that can be attained with a reflector of a given size and the side lobe level of the configuration. 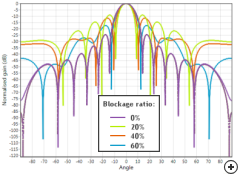 By including a blockage model in the design approach, Antenna Magus is able to compensate for blockage effects on the overall antenna performance as illustrated in the next example of two pattern fed parabolic reflector designs. The first design is for a specified gain and includes the effect of the blockage, specifying BR to be 20%. With the second design all the input parameters are kept constant while excluding the blockage ratio effect. 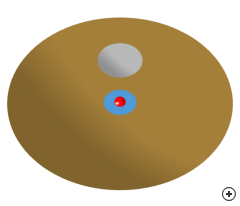 In the first design, Antenna Magus compensates for the aperture blockage by designing the large reflector to be larger than when the blockage effect is ignored to realise the same gain. Design comparison: including and excluding feed blockage effect. Total gain patterns for a pattern fed parabolic reflector design including and excluding the blockage effect. A number of the parabolic reflector antennas available in Antenna Magus do not assume a specific feed antenna topology, but rather provide a theoretical feed pattern that can be tailored to approximate the radiation pattern of any feed antenna. 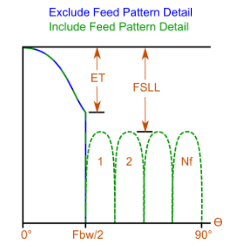 The main-beam properties of the theoretical feed pattern may be adjusted (specifying the beamwidth and/or feed distribution efficiency). 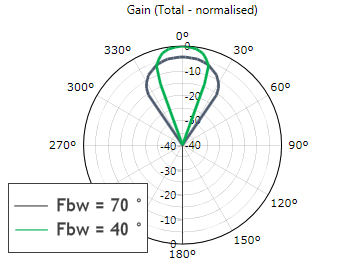 A basic feed-pattern model such as this one will not include the effect of feed antenna side lobes on the overall performance of the antenna. 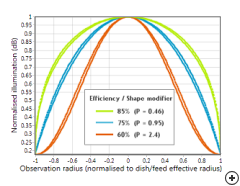 To make provision for the consideration on these effects, the feed model has been expanded to include optional controllable side lobes in performance estimates results and in the feed patterns of exported models. 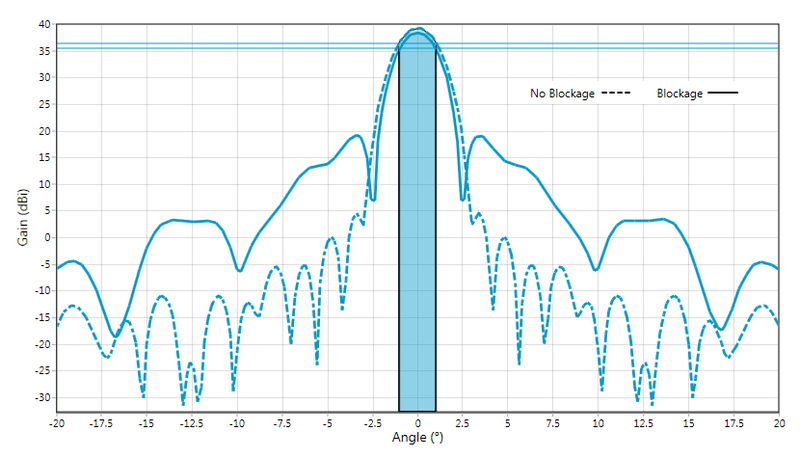 By using the enhanced theoretical pattern feed options, a design may now be adjusted to achieve specific performance for a predetermined feed type, including the effects of aperture blockage and illumination efficiency. 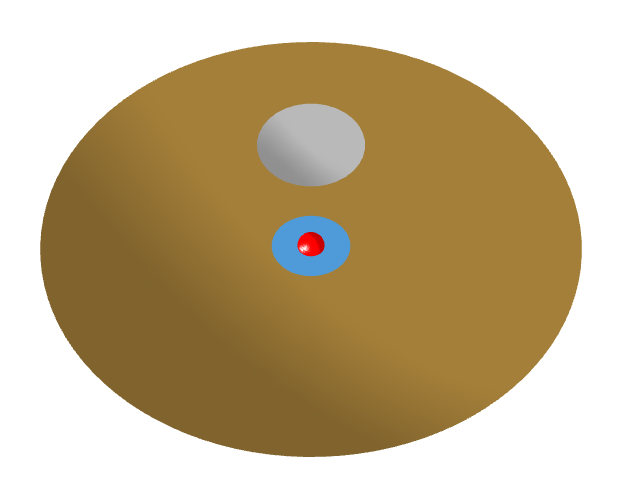 Image of the Parabolic horn fed reflector with shroud. Axisymmetric prime focus paraboloidal reflectors provide a good compromise between performance and cost, but can suffer from high-side lobe levels if designed for high efficiency. 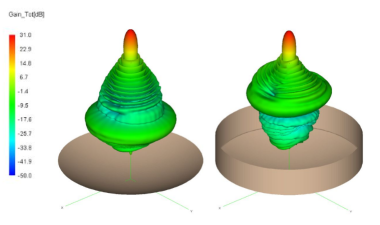 Here's a simple, practical, low-cost method is presented for suppressing close-in side lobes to comply with stringent radiation pattern envelope specifications. The antenna consists of an axisymmetric parabolic reflector and a metallic cylindrical shroud which extends from the rim of the reflector dish. The feed used here is a pyramidal horn antenna designed to give the desired illumination level of the paraboloid edges, e.g. -10 dB. The E- and H-plane beamwidths are approximately equal and the -10 dB beamwidth can be specified. A variety of other feed antennas may also be used, including simple conical horns, corrugated conical horns, compound box horns and axial-choke horns, to name a few. The Shrouded pattern fed parabolic reflector antenna (already in Antenna Magus) can be designed to substitute the horn feed with a theoretical, simulated or measured pattern. 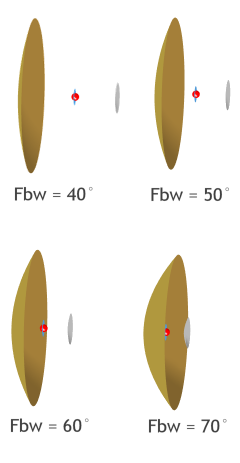 The image below compares the patterns of a parabolic reflector with and without a shroud. The reduction in the spill over radiation is very clear. 3D gain comparison for a parabolic reflector with and without a shroud. Two calculators that are useful when designing parabolic reflector antennas were added to the Antenna Magus toolbox. 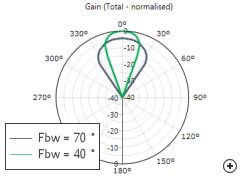 For a specific parabolic reflector dish and feed antenna, the gain pattern may be calculated using the new handy Pattern approximation tool. This tool allows the user to consider the theoretical gain and pattern performance of larger reflectors (which could result in long simulation times) or predict the influence of parameters like blockage ratio or feed distribution efficiency. For example, the tool can be used to study the effect of blockage ratio on the pattern without having to do any simulations. Shown below is the graph generated from that study. 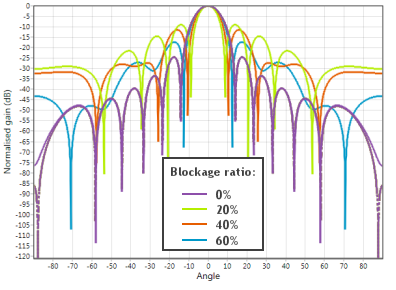 Example of normalised gain vs angle calculated for different blockage ratios. This calculator plots the aperture and feed distribution for a given focal length to diameter (F/D) ratio, edge taper (ET) and aperture / feed distribution efficiency (ade / fde). Example of calculated feed distributions vs efficiency. The Magus team has big plans for Antenna Magus in 2012. During 2012 we will be releasing version 4.0, for which we have set ourselves the ambitious target of including a database of 200 antennas! We hope that the sheer size of the database will not shadow the new calculators and features that we add. 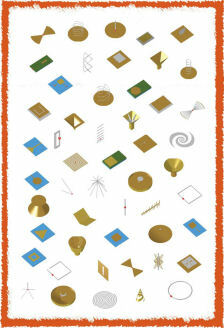 Antenna Magus will be offering a half day workshop in conjunction with ACES 2012. If you are interested to attend, please go to http://aces.ee.olemiss.edu/conference/2012/ or contact your reseller for more information. We hope that you enjoy a prosperous 2012!